Nickel is a chemical element with symbol Ni and atomic number 28. It is a silvery-white lustrous metal with a slight golden tinge. Nickel belongs to the transition metals and is hard and ductile. Pure nickel, powdered to maximize the reactive surface area, shows a significant chemical activity, but larger pieces are slow to react with air under standard conditions because an oxide layer forms on the surface and prevents further corrosion (passivation). Even so, pure native nickel is found in Earth's crust only in tiny amounts, usually in ultramafic rocks, and in the interiors of larger nickel–iron meteorites that were not exposed to oxygen when outside Earth's atmosphere. Meteoric nickel is found in combination with iron, a reflection of the origin of those elements as major end products of supernova nucleosynthesis. An iron–nickel mixture is thought to compose Earth's inner core. Use of nickel (as a natural meteoric nickel–iron alloy) has been traced as far back as 3500 BCE. Nickel was first isolated and classified as a chemical element in 1751 by Axel Fredrik Cronstedt, who initially mistook the ore for a copper mineral, in the cobalt mines of Los, Hälsingland, Sweden. The element's name comes from a mischievous sprite of German miner mythology, Nickel (similar to Old Nick), that personified the fact that copper-nickel ores resisted refinement into copper. An economically important source of nickel is the iron ore limonite, which often contains 1–2% nickel. Nickel's other important ore minerals include garnierite, and pentlandite. Major production sites include the Sudbury region in Canada (which is thought to be of meteoric origin), New Caledonia in the Pacific, and Norilsk in Russia. Nickel is slowly oxidized by air at room temperature and is considered corrosion-resistant. Historically, it has been used for plating iron and brass, coating chemistry equipment, and manufacturing certain alloys that retain a high silvery polish, such as German silver. About 6% of world nickel production is still used for corrosion-resistant pure-nickel plating. Nickel-plated objects sometimes provoke nickel allergy. Nickel has been widely used in coins, though its rising price has led to some replacement with cheaper metals in recent years. Nickel is one of four elements (iron, cobalt, nickel, and gadolinium) that are ferromagnetic at approximately room temperature. Alnico permanent magnets based partly on nickel are of intermediate strength between iron-based permanent magnets and rare-earth magnets. The metal is valuable in modern times chiefly in alloys; about 60% of world production is used in nickel-steels (particularly stainless steel). Other common alloys and some new superalloys comprise most of the remainder of world nickel use, with chemical uses for nickel compounds consuming less than 3% of production. As a compound, nickel has a number of niche chemical manufacturing uses, such as a catalyst for hydrogenation. Nickel is an essential nutrient for some microorganisms and plants that have enzymes with nickel as an active site. Licensed under Creative Commons Attribution-Share Alike 3.0 (Materialscientist at English Wikipedia). Nickel is a chemical element with symbol Ni and atomic number 28. It is a silvery-white lustrous metal with a slight golden tinge. Nickel belongs to the transition metals and is hard and ductile. Pure nickel, powdered to maximize the reactive surface area, shows a significant chemical activity, but larger pieces are slow to react with air under standard conditions because an oxide layer forms on the surface and prevents further corrosion (passivation). Even so, pure native nickel is found in Earth's crust only in tiny amounts, usually in ultramafic rocks, and in the interiors of larger nickel–iron meteorites that were not exposed to oxygen when outside Earth's atmosphere. Meteoric nickel is found in combination with iron, a reflection of the origin of those elements as major end products of supernova nucleosynthesis. An iron–nickel mixture is thought to compose Earth's inner core. Use of nickel (as a natural meteoric nickel–iron alloy) has been traced as far back as 3500 BCE. Nickel was first isolated and classified as a chemical element in 1751 by Axel Fredrik Cronstedt, who initially mistook the ore for a copper mineral, in the cobalt mines of Los, Hälsingland, Sweden. The element's name comes from a mischievous sprite of German miner mythology, Nickel (similar to Old Nick), that personified the fact that copper-nickel ores resisted refinement into copper. An economically important source of nickel is the iron ore limonite, which often contains 1–2% nickel. Nickel's other important ore minerals include garnierite, and pentlandite. Major production sites include the Sudbury region in Canada (which is thought to be of meteoric origin), New Caledonia in the Pacific, and Norilsk in Russia. Nickel is slowly oxidized by air at room temperature and is considered corrosion-resistant. Historically, it has been used for plating iron and brass, coating chemistry equipment, and manufacturing certain alloys that retain a high silvery polish, such as German silver. About 6% of world nickel production is still used for corrosion-resistant pure-nickel plating. Nickel-plated objects sometimes provoke nickel allergy. Nickel has been widely used in coins, though its rising price has led to some replacement with cheaper metals in recent years. Nickel is one of four elements (iron, cobalt, nickel, and gadolinium) that are ferromagnetic at approximately room temperature. Alnico permanent magnets based partly on nickel are of intermediate strength between iron-based permanent magnets and rare-earth magnets. The metal is valuable in modern times chiefly in alloys; about 60% of world production is used in nickel-steels (particularly stainless steel). Other common alloys and some new superalloys comprise most of the remainder of world nickel use, with chemical uses for nickel compounds consuming less than 3% of production. As a compound, nickel has a number of niche chemical manufacturing uses, such as a catalyst for hydrogenation. Nickel is an essential nutrient for some microorganisms and plants that have enzymes with nickel as an active site. TEM image of a Ni nanocrystal inside a single wall carbon nanotube segment; scale bar 5 nm. Nickel is a silvery-white metal with a slight golden tinge that takes a high polish. It is one of only four elements that are magnetic at or near room temperature, the others being iron, cobalt and gadolinium. Its Curie temperature is 355 °C (671 °F), meaning that bulk nickel is non-magnetic above this temperature. The unit cell of nickel is a face-centered cube with the lattice parameter of 0.352 nm, giving an atomic radius of 0.124 nm. This crystal structure is stable to pressures of at least 70 GPa. Nickel belongs to the transition metals and is hard and ductile. The nickel atom has two electron configurations, [Ar] 3d8 4s2 and [Ar] 3d9 4s1, which are very close in energy – the symbol [Ar] refers to the argon-like core structure. There is some disagreement on which configuration has the lowest energy. Chemistry textbooks quote the electron configuration of nickel as [Ar] 4s2 3d8, which can also be written [Ar] 3d8 4s2. This configuration agrees with the Madelung energy ordering rule, which predicts that 4s is filled before 3d. It is supported by the experimental fact that the lowest energy state of the nickel atom is a 3d8 4s2 energy level, specifically the 3d8(3F) 4s2 3F, J = 4 level. However, each of these two configurations gives rise to several energy levels, and the two sets of energy levels overlap. The average energy of states with configuration [Ar] 3d9 4s1 is actually lower than the average energy of states with configuration [Ar] 3d8 4s2. For this reason, the research literature on atomic calculations quotes the ground state configuration of nickel as [Ar] 3d9 4s1. Ni with 6.077 days. All of the remaining radioactive isotopes have half-lives that are less than 60 hours and the majority of these have half-lives that are less than 30 seconds. This element also has one meta state. Ni has been used to date the terrestrial age of meteorites and to determine abundances of extraterrestrial dust in ice and sediment. Nickel-78's half-life was recently measured at 110 milliseconds, and is believed an important isotope in supernova nucleosynthesis of elements heavier than iron. The nuclide 48Ni, discovered in 1999, is the most proton-rich heavy element isotope known. With 28 protons and 20 neutrons 48Ni is "double magic" (like 208Pb) and therefore unusually stable. Identified land-based resources throughout the world averaging 1% nickel or greater comprise at least 130 million tons of nickel (about the double of known reserves). About 60% is in laterites and 40% in sulfide deposits. On geophysical evidence, most of the nickel on Earth is believed to be in the Earth's outer and inner cores. Kamacite and taenite are naturally occurring alloys of iron and nickel. For kamacite, the alloy is usually in the proportion of 90:10 to 95:5, although impurities (such as cobalt or carbon) may be present, while for taenite the nickel content is between 20% and 65%. Kamacite and taenite are also found in nickel iron meteorites. The most common oxidation state of nickel is +2, but compounds of Ni0, Ni+, and Ni3+ are well known, and the exotic oxidation states Ni2−, Ni1−, and Ni4+ have been produced and studied. Some tetracoordinate nickel(II) complexes, e.g. bis(triphenylphosphine)nickel chloride, exist both in tetrahedral and square planar geometries. The tetrahedral complexes are paramagnetic, whereas the square planar complexes are diamagnetic. In having properties of magnetic equilibrium and formation of octahedral complexes, they contrast with the divalent complexes of the heavier group 10 metals, palladium(II) and platinum(II), which form only square-planar geometry. Numerous Ni(III) compounds are known, with the first such examples being Nickel(III) trihalophosphines (NiIII(PPh3)X3). Further, Ni(III) forms simple salts with fluoride or oxide ions. Ni(III) can be stabilized by σ-donor ligands such as thiols and phosphines. 3, while Ni(III) is present in nickel(III) oxide, which is used as the cathode in many rechargeable batteries, including nickel-cadmium, nickel-iron, nickel hydrogen, and nickel-metal hydride, and used by certain manufacturers in Li-ion batteries. Ni(IV) remains a rare oxidation state of nickel and very few compounds are known to date. Because the ores of nickel are easily mistaken for ores of silver, understanding of this metal and its use dates to relatively recent times. However, the unintentional use of nickel is ancient, and can be traced back as far as 3500 BCE. Bronzes from what is now Syria have been found to contain as much as 2% nickel. Some ancient Chinese manuscripts suggest that "white copper" (cupronickel, known as baitong) was used there between 1700 and 1400 BCE. This Paktong white copper was exported to Britain as early as the 17th century, but the nickel content of this alloy was not discovered until 1822. Coins of nickel-copper alloy were minted by the Bactrian kings Agathocles, Euthydemus II and Pantaleon in the 2nd Century BCE, possibly out of the Chinese cupronickel. In medieval Germany, a red mineral was found in the Erzgebirge (Ore Mountains) that resembled copper ore. However, when miners were unable to extract any copper from it, they blamed a mischievous sprite of German mythology, Nickel (similar to Old Nick), for besetting the copper. They called this ore Kupfernickel from the German Kupfer for copper. This ore is now known to be nickeline (aka niccolite), a nickel arsenide. In 1751, Baron Axel Fredrik Cronstedt tried to extract copper from kupfernickel at a cobalt mine in the Swedish village of Los, and instead produced a white metal that he named after the spirit that had given its name to the mineral, nickel. In modern German, Kupfernickel or Kupfer-Nickel designates the alloy cupronickel. Originally, the only source for nickel was the rare Kupfernickel. Beginning in 1824, nickel was obtained as a byproduct of cobalt blue production. The first large-scale smelting of nickel began in Norway in 1848 from nickel-rich pyrrhotite. The introduction of nickel in steel production in 1889 increased the demand for nickel, and the nickel deposits of New Caledonia, discovered in 1865, provided most of the world's supply between 1875 and 1915. The discovery of the large deposits in the Sudbury Basin, Canada in 1883, in Norilsk-Talnakh, Russia in 1920, and in the Merensky Reef, South Africa in 1924, made large-scale production of nickel possible. 99.9% nickel five-cent coins were struck in Canada (the world's largest nickel producer at the time) during non-war years from 1922–1981; the metal content made these coins magnetic. During the wartime period 1942–45, most or all nickel was removed from Canadian and U.S. coins to save it for manufacturing armor. Canada used 99.9% nickel from 1968 in its higher-value coins until 2000. Coins of nearly pure nickel were first used in 1881 in Switzerland. Birmingham forged nickel coins in about 1833 for trading in Malaya. In the 21st century, the high price of nickel has led to some replacement of the metal in coins around the world. Coins still made with nickel alloys include one- and two-euro coins, 5¢, 10¢, 25¢ and 50¢ U.S. coins, and 20p, 50p, £1 and £2 UK coins. Nickel-alloy in 5p and 10p UK coins was replaced with nickel-plated steel began in 2012, causing allergy problems for some people and public controversy. The Philippines, Indonesia, Russia, Canada and Australia are the world's largest producers of nickel, as reported by the US Geological Survey. The largest deposits of nickel in non-Russian Europe are located in Finland and Greece. Identified land-based resources averaging 1% nickel or greater contain at least 130 million tons of nickel. About 60% is in laterites and 40% is in sulfide deposits. In addition, extensive deep-sea resources of nickel are in manganese crusts and nodules covering large areas of the ocean floor, particularly in the Pacific Ocean. The one locality in the United States where nickel has been profitably mined is Riddle, Oregon, where several square miles of nickel-bearing garnierite surface deposits are located. The mine closed in 1987. The Eagle mine project is a new nickel mine in Michigan's upper peninsula. Construction was completed in 2013, and operations began in the third quarter of 2014. In the first full year of operation, Eagle Mine produced 18,000 tonnes. The purest metal is obtained from nickel oxide by the Mond process, which achieves a purity of greater than 99.99%. The process was patented by Ludwig Mond and has been in industrial use since before the beginning of the 20th century. In this process, nickel is reacted with carbon monoxide in the presence of a sulfur catalyst at around 40–80 °C to form nickel carbonyl. Iron gives iron pentacarbonyl, too, but this reaction is slow. If necessary, the nickel may be separated by distillation. Dicobalt octacarbonyl is also formed in nickel distillation as a by-product, but it decomposes to tetracobalt dodecacarbonyl at the reaction temperature to give a non-volatile solid. Nickel is obtained from nickel carbonyl by one of two processes. It may be passed through a large chamber at high temperatures in which tens of thousands of nickel spheres, called pellets, are constantly stirred. The carbonyl decomposes and deposits pure nickel onto the nickel spheres. In the alternate process, nickel carbonyl is decomposed in a smaller chamber at 230 °C to create a fine nickel powder. The byproduct carbon monoxide is recirculated and reused. The highly pure nickel product is known as "carbonyl nickel". The market price of nickel surged throughout 2006 and the early months of 2007; as of April 5, 2007, the metal was trading at US$52,300/tonne or $1.47/oz. The price subsequently fell dramatically, and as of September 19, 2013, the metal was trading at $13,778/tonne, or $0.39/oz. The US nickel coin contains 0.04 ounces (1.1 g) of nickel, which at the April 2007 price was worth 6.5 cents, along with 3.75 grams of copper worth about 3 cents, with a total metal value of more than 9 cents. Since the face value of a nickel is 5 cents, this made it an attractive target for melting by people wanting to sell the metals at a profit. However, the United States Mint, in anticipation of this practice, implemented new interim rules on December 14, 2006, subject to public comment for 30 days, which criminalized the melting and export of cents and nickels. Violators can be punished with a fine of up to $10,000 and/or imprisoned for a maximum of five years. As of September 19, 2013, the melt value of a U.S. nickel (copper and nickel included) is $0.045, which is 90% of the face value. The global production of nickel is presently used as follows: 46% in nickel steel; 34% nonferrous alloys and superalloys; 14% electroplating, and 6% other uses. Nickel is used in many specific and recognizable industrial and consumer products, including stainless steel, alnico magnets, coinage, rechargeable batteries, electric guitar strings, microphone capsules, plating on plumbing fixtures, and special alloys such as permalloy, elinvar, and invar. It is used for plating and as a green tint in glass. Nickel is preeminently an alloy metal, and its chief use is in nickel steels and nickel cast irons, in which it typically increases the tensile strength, toughness, and elastic limit. It is widely used in many other alloys, including nickel brasses and bronzes and alloys with copper, chromium, aluminium, lead, cobalt, silver, and gold (Inconel, Incoloy, Monel, Nimonic). Nickel is an excellent alloying agent for certain precious metals and is used in the fire assay as a collector of platinum group elements (PGE). As such, nickel is capable of fully collecting all 6 PGE elements from ores, and of partially collecting gold. High-throughput nickel mines may also engage in PGE recovery (primarily platinum and palladium); examples are Norilsk in Russia and the Sudbury Basin in Canada. Nickel is a naturally magnetostrictive material, meaning that, in the presence of a magnetic field, the material undergoes a small change in length. 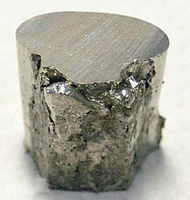 The magnetostriction of nickel is on the order of 50 ppm and is negative, indicating that it contracts. Nickel is used as a binder in the cemented tungsten carbide or hardmetal industry and used in proportions of 6% to 12% by weight. Nickel makes the tungsten carbide magnetic and adds corrosion-resistance to the cemented parts, although the hardness is less than those with a cobalt binder. 2 to form protons and electrons, and can also catalyze the reverse reaction, the reduction of protons to form hydrogen gas. A nickel-tetrapyrrole coenzyme, cofactor F430, is present in methyl coenzyme M reductase, which can catalyze the formation of methane, or the reverse reaction, in methanogenic archaea. One of the carbon monoxide dehydrogenase enzymes consists of an Fe-Ni-S cluster. Other nickel-bearing enzymes include a rare bacterial class of superoxide dismutase and glyoxalase I enzymes in bacteria and several parasitic eukaryotic trypanosomal parasites (in higher organisms, including yeast and mammals, this enzyme contains divalent Zn2+). Dietary nickel may affect human health through infections by nickel-dependent bacteria, but it is also possible that nickel is an essential nutrient for bacteria residing in the large intestine, in effect functioning as a prebiotic. The U.S. Institute of Medicine has not confirmed that nickel is an essential nutrient for humans, so neither a Recommended Dietary Allowance (RDA) nor an Adequate Intake have been established. The Tolerable Upper Intake Level of dietary nickel is 1000 µg/day as soluble nickel salts. Dietary intake is estimated at 70 to 100 µg/day, with less than 10% absorbed. What is absorbed is excreted in urine. Relatively large amounts of nickel – comparable to the estimated average ingestion above – leach into food cooked in stainless steel. For example, the amount of nickel leached after 10 cooking cycles into one serving of tomato sauce averages 88 µg. Nickel released from Siberian Traps volcanic eruptions is suspected of assisting the growth of Methanosarcina, a genus of euryarchaeote archaea that produced methane during the biggest extinction event on record. The major source of nickel exposure is oral consumption. Nickel is found naturally in both food and water, and may be increased by human pollution. For example, nickel-plated faucets may contaminate water and soil; mining and smelting may dump nickel into waste-water; nickel–steel alloy cookware and nickel-pigmented dishes may release nickel into food. The atmosphere may be polluted by nickel metal refining and fossil fuel combustion. Humans may absorb nickel directly from tobacco smoke and skin contact with jewelry, shampoos, detergents, and coins. A less-common form of chronic exposure is through hemodialysis as traces of nickel ions may be absorbed into the plasma from the chelating action of albumin. The average daily exposure does not pose a threat to human health. Most of the nickel absorbed every day by humans is removed by the kidneys and passed out of the body through urine or is eliminated through the gastrointestinal tract without being absorbed. Nickel is not a cumulative poison, but larger doses or chronic exposure may be toxic, even carcinogenic, and constitute an occupational hazard. Nickel compounds, as a group, are carcinogenic and cause lung and nasal cancer. The mechanism through which Nickel compounds are carcinogenic is not clear. Nickel-refinery workers exposed to nickel compounds had a significant risk of lung cancer. If they smoked, the risk was even higher than the separate risk from smoking plus the risk from Nickel compounds. In animal studies, Nickel compounds were associated with tumors in various other sites throughout the body. In the US, the minimal risk level of nickel and its compounds is set to 0.2 µg/m3 for inhalation during 15–364 days. 4] is an extremely toxic gas. The toxicity of metal carbonyls is a function of both the toxicity of the metal and the off-gassing of carbon monoxide from the carbonyl functional groups; nickel carbonyl is also explosive in air. Sensitized individuals may show a skin contact allergy to nickel known as a contact dermatitis. Highly sensitized individuals may also react to foods with high nickel content. Sensitivity to nickel may also be present in patients with pompholyx. Nickel is the top confirmed contact allergen worldwide, partly due to its use in jewelry for pierced ears. Nickel allergies affecting pierced ears are often marked by itchy, red skin. Many earrings are now made without nickel or low-release nickel to address this problem. The amount allowed in products that contact human skin is now regulated by the European Union. In 2002, researchers found that the nickel released by 1 and 2 Euro coins was far in excess of those standards. This is believed to be the result of a galvanic reaction. Nickel was voted Allergen of the Year in 2008 by the American Contact Dermatitis Society. In August 2015, the American Academy of Dermatology adopted a position statement on the safety of nickel: "Estimates suggest that contact dermatitis, which includes nickel sensitization, accounts for approximately $1.918 billion and affects nearly 72.29 million people." Reports show that both the nickel-induced activation of hypoxia-inducible factor (HIF-1) and the up-regulation of hypoxia-inducible genes are caused by depletion of intracellular ascorbate. The addition of ascorbate to the culture medium increased the intracellular ascorbate level and reversed both the metal-induced stabilization of HIF-1- and HIF-1α-dependent gene expression.